They and third placed French veteran Jean-Luc Van Den Heede, 30 miles astern of the leading pair, and all racing identical Rustler yachts, have been touching speeds of 8knots at times under spinnakers overnight. Are Wiig, is also doing extremely well considering that the Norwegian is sailing one of the smallest of these traditional yachts, the OE 32 double-ender Olleanne. He has now pulled 32 miles ahead of Britain’s Susie Goodall in another Rustler DHL Starlight, though both have reported problems: Wiig has blown out a spinnaker, while Goodall has found that the solar panels on her British yacht are not working and took a following wave onboard today which has flooded the cabin. One of the biggest winners during this second week at sea since leaving Les Sables d’Olonne on July 1st, is Irishman Gregor McGuckin and his Biscay 36 Hanley Energy Endurance. He has moved up from 10th to fifth place in recent days and is clearly making most from the extra sail area that his ketch rigged boat can carry in these steady down-wind conditions. 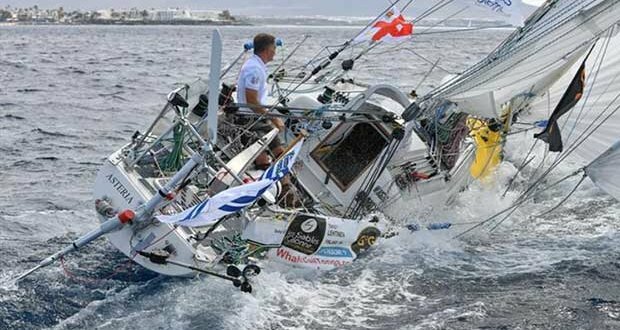 The losers are Australian mountaineer and adventurer Kevin Farebrother who pulled out of the Race on Sunday, disillusioned by solo sailing and lack of sleep, Antoine Cousot, Istvan Kopar and Nabil Amra who have been struggling with faulty wind vane self steering equipment. For Cousot, the problems had become so overwhelming that he decided to pull in to Marina Rubicon to make repairs, sacrificing his place in the Golden Globe Race. As a result, the Frenchman is the first to be demoted to the Chichester Class for those who make one stop during this solo circumnavigation. He hopes to have his Biscay 36 Métier Intérim back at sea by tonight. Kopar, the USA/Hungarian sailing the Tradewind 35 Puffin who is using the same WindPilot system as Cousot, told Race organisers yesterday. One consoling thought is that Sir Robin Knox-Johnston suffered similar problems 50 years ago and was forced to hand steer for two-thirds of his solo non-stop circumnavigation in his yacht Suhaili. “Robin did it, so I will give it a go too” He said stoically as he sailed through the Marina Rubicon gate in last place to chase after the fleet. Nabil Amra, the US/Palestinian entrant sailing the Biscay 36 Liberty II has even worse problems. A weld on his French made Beaufort self-steering failed early this morning and is now faced with either putting in to an African port or sailing back upwind to the Canaries to affect repairs and join Cousot in the Chichester class.